2015 Chevrolet SS Pros and Cons: Why (Not) This Car? Full-size rear-wheel-drive sedans priced within the financial grasp of the middle class aren't nearly as popular as they once were. I've never personally owned one, and probably never will. I tend to prefer smaller, lighter, more agile cars. But the few that remain are so good that whenever I drive one I start to reconsider my long-held personal preferences. If you are interested in such a car--and more people probably should be--there isn't a bad choice among the current offerings. But which one would be the best car for you? A few months ago I reviewed the Dodge Charger R/T, comparing it to the Chevrolet SS. Here the latter, based on the Australia's Holden Commodore, gets its turn in the spotlight. Suede trim, red stitching, and metal pedals dress up what would otherwise be a boring interior. Why the 2015 Chevrolet SS? The Chevrolet SS and Dodge Charger might both be large rear-wheel-drive sedans with American badges, but they drive very differently. The SS doesn't go down the road with same confident, big-shouldered swagger as the Charger. Instead, it feels considerably smaller, lighter, and more agile. This is partly because the SS is smaller and lighter, with a wheelbase shorter by 5.4 inches (114.8 vs. 102.2), an overall length shorter by 2.9 inches (195.5 vs. 198.4), and a curb weight lighter by nearly 300 pounds (3,975 vs. 4,264). Driving position also makes a difference. You sit much higher relative to the instrument panel in the Chevrolet, and its windows are larger than the Dodge's, so outward visibility is more confidence-inspiring. Not all is perfect here, though. The SS's A-pillars (the ones flanking the windshield) are so wide that they can obstruct the driver's view in curves. The largest difference, though, is is the tuning of the steering and suspension. The Chevrolet's chassis provides more nuanced feedback and feels much more willing to rotate. Each reaction to the steering and throttle (you can easily steer with the latter, too) feels quick, precise, and exactly as expected, making the SS an unusually intuitive car to hustle along a curvy road or around a track. In comparison, the Dodge, though very capable for such a large, heavy car, feels like a much blunter (if also much harder-hitting with the SRT engines) instrument. Both are great fun, but the SS has a less juvenile appeal. With a 415-horsepower 6.2-liter V8, the Chevrolet SS is a little quicker than the heavier, 370-horsepower Dodge Charger R/T in a straight line, but cannot keep up with the 485-horsepower Charger SRT, much less the 707-horsepower Charger SRT Hellcat. If you don't need to get from a dead stop to 60 miles-per-hour in well under five seconds, the SS will do. But if you're seeking the quickest, most gut-wrenching car, the Dodge is the way to go. Unless you want a manual transmission. For 2015 one became an option on the SS, but remains unavailable on the Dodge sedan. (You can get a manual on the related Challenger coupe.) The manual shifter in the Chevrolet feels solid and precise. It's a joy to operate, and provides a more direct and engaging connection to the car, further heightening the joy of driving the SS along a curvy road. 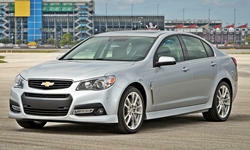 For the manual transmission alone I've listed "feature availability" among the reasons to buy a Chevrolet SS. In other respects the SS offers fewer features than the Dodge Charger. Most notably, only one engine is offered, while with the Dodge you can get engines ranging from a 292-horsepower V6 to a 707-horsepower supercharged V8. Somewhat elegant from the rear quarter. A car with handling and acceleration suitable for the track ought to also have strong brakes, and the Chevrolet SS does, with standard Brembo four-piston fixed calipers. The Dodge's brakes are also strong, but as with its handling don't feel as responsive or as easy to precisely modulate. Safety features on the SS include forward collision warning, lane departure warning (more nuisance than aid in pretty much every current application), and blind spot warning with rear cross-traffic alert. Don't feel the need for this stuff? Too bad, unlike on the Dodge it's all standard. 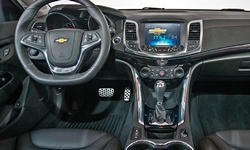 Despite its slightly more compact exterior, the Chevrolet SS has a roomier back seat than the Dodge Charger. Rear headroom is in unexpectedly short supply in the latter. The Chevrolet also has a couple more inches of rear hiproom, so three adults won't have to get quite as cozy in its back seat. Both cars have about 16 cubic feet of trunk space. A good amount, but you'll find as much in most midsize sedans. Unlike the Charger's, the SS's rear seat cannot fold to expand the trunk. But a pass-through in the center is far larger than most. GM offered a similar car once before, the Pontiac G8 GXP. Six years after that car was discontinued, used examples with low miles--especially those with manual transmissions--continue to sell for close to what they cost new. If, as seems almost certain, the SS is similarly discontinued after the 2017 model year (at the latest), used examples could similarly hold their value. Why Not the 2015 Chevrolet SS? While a big rear-wheel-drive sedan might seem the most American of Chevrolets (the cars, anyway), the SS is actually manufactured in Australia then shipped half way around the world. It is so expensive to make cars in Australia that all of the domestic auto plants are scheduled to be shut down in the next year or two. Then again, the Australian dollar was been weakening against the U.S. dollar, so perhaps GM will give its decision to terminate Australian assembly another thought. The two currencies were close to parity from April 2011 through April 2013, the latter month about the time the SS was priced for the U.S. market. But from May 2013 onwards the Aussie currency has been falling, and as I type this is worth about 73 U.S. cents. Sixty-four percent of the SS's parts content plus all of its assembly are Australian. Do the math, and it likely costs GM only about 80 percent as much to make the SS as it did when the car's pricing was decided. Unfortunately, the SS's pricing still reflects the exhange rates of April 2013. Compounding this, GM appears to have assumed that people would expect a car with a price in the 40s to have nearly everything standard, so it made nearly everything standard, including a high-performance V8 engine, heated-and-cooled leather-plus-synth-suede front seats, a head-up display (HUD), and a full array of collision warning systems. The only extra-cost options are a sunroof and a full-size spare tire. Standard isn't the same as free, so a price that would have been high at any rate received another bump. Where is all of this leading? Well, to a base price of $48,040. Add $900 for a sunroof. The manual transmission is a no-cost option, but bumps the MPG ratings just enough to avoid the automatic's $1,300 gas guzzler tax. The tested car, with the manual and the sunroof, listed for $47,640. The Pontiac G8 GXP, itself much more expensive than G8s with less powerful engines, listed for $6,050 less with a manual transmission, and $8,045 less with an automatic. But it was much less lavishly equipped. Adjust for the SS's additional standard equipment, and it's priced very close to where the G8 was back in 2009. Does nearly $50,000 seem like a lot for a Chevrolet sedan? No argument here. The Dodge R/T even when similarly equipped lists for over $7,000 less. If you want the Dodge with the 485-horsepower engine, though, it's just a little less expensive than the SS. Anything remotely comparable with a foreign nameplate will cost far more than either the SS or the Charger. A BMW M5 costs twice as much. Compared to them, either car is a bargain. But compared to the Dodge the Chevrolet seems a little expensive. My mention of a $1,300 gas guzzler tax foreshadowed this "why not." If you want a fuel-efficient car, you probably don't want a big, V8-powered sedan. But even compared to the Dodge Charger R/T the SS is a guzzler. This is partly because the very small number sold doesn't justify an upgrade to GM's latest engine and transmission technology, which includes variable valve timing, cylinder deactivation, and eight-speed automatic transmissions. These technologies enable the Charger R/T to earn EPA ratings of 16 mpg city, 25 mpg highway, while the SS can only manage 14/21 with a six-speed automatic or 15/21 with a six-speed manual (which skips from first to fourth under light throttle). In my real-world driving, the trip computer usually reported an average around 16 or 17 in the suburbs (20 if I drove with a very light foot) and MAYBE 24 on the highway. The trip computer in the Dodge reported averages that were usually higher by a couple MPG, but keep its engine in V4 mode (i.e. no lights to stop for) and the average can reach 30. Grafted on Chevrolet face does the SS no favors. The front seats in the Chevrolet SS are comfortable. They also look like they'd provide generous lateral support, but don't, at least not for those of us who aren't built like linebackers. Thankfully the upper seat back features some synthetic suede trim, and this prevents sliding in hard turns. Still, a car with such high handling limits should have seats with much larger and more effective side bolsters--like those available in the Dodge Charger. With a strong hint of the early 2000s E46 BMW 3 Series, the basic shape of the Chevrolet SS's body is quietly handsome. But for some reason Chevrolet decided to festoon this body with much chrome trim, plus chrome wheels. To help justify the car's price? Well, the chrome looks out of place and out of character. For 2016 Chevrolet has replaced the chrome wheels and reworked the front-end styling. The resulting appearance is an improvement, but the "rent me" double-grille and droopy front headlamps remain, and many people will still wonder if the car is a Malibu or an Impala. The Dodge Charger, while no beauty, has brawny styling more consistent with its character and role. If you love the burble and roar of a highly tuned V8's exhaust, you've come to the right place. Lift off the SS's throttle at a moderate to high RPM, and you'll also be treated to some track-worthy snaps, crackles, and pops. The Chevrolet SS's V8 provides even more aural pleasure than the "Hemi" in the Dodge Charger. But do you want this noise all the time? The SS's exhaust rarely goes silent. Even in casual driving it roars when accelerating, and it drones a little on the highway. The Dodge engine has more of a dual personality, raunchy when you want it to be, quiet and relaxed otherwise. There's also less road noise inside the Charger. The SS's interior styling is generic Chevrolet spruced up with synthetic suede trim, red stitching, and metal pedals. All welcome additions that add some much needed sportiness, but the Charger's interior, with a retro vibe, has a more distinctive appearance. Materials inside the SS are generally pretty good, but the hard plastic top surface of the instrument panel isn't expected at this price. The Chevrolet SS's controls are well-designed and easy to use, but the Dodge Charger's, perhaps the best in the industry, are even easier. Both cars include a g-meter, but only the Chevrolet has a head-up display (that can be configured to include this g-meter). The Chevrolet SS doesn't pretend to own the road like the Dodge Charger does, and it isn't as quiet when cruising, but in other respects it rides better. For 2015, adaptive dampers were added to the standard features list, and these contribute to good bump absorption even when set to "performance" mode. In "touring" mode the car can feel a touch floaty, so I tended to leave the suspension set to "performance" even on poorly maintained roads. The dampers react so quickly to conditions in either mode that the difference between "performance" and "touring" is not dramatic. Unlike in the Dodge, there are no sharp tire impacts and there's no sensation that the suspension can't quite manage the mass of the wheels. It probably helps that the SS's wheels and tires are a little smaller, 19s rather than 20s, and thus lighter. Despite the SS's track-worthy handling, it is a very livable car. GM probably won't make the SS for much longer. Want one? Then now is the time to buy one. If the late, much lamented, related Pontiac G8 GXP is any indication, once the SS is similarly out-of-production the depreciation of used examples in good condition will be minimal. People who really know (and love) cars know that the Chevrolet SS, like the Pontiac G8 GXP, is one to buy then hold on to. A bit of a mess under the cover, the SS's engine could be better dressed. Sounds great, though. Decent trunk. The rear seat doesn't fold, but there's a large pass-through. Chevrolet and Dodge each provided an insured car for a week with a tank of gas. 2015 Chevrolet SS pros and cons, according to Michael Karesh: the best reasons for buying (or not buying) the 2015 Chevrolet SS. Join TrueDelta to post your own impressions. As I'd never choose Merlot over a Bud Mang-o-ritI'd never choose GM over SRT. The lack of a truly exciting exterior is my main turn off. Even without the 6.4, the 5.7 and even 3.6 Chargers are cooler. The 2012 Charger and even the newest "Dart" Charger look menacing and powerful. Of course, I'd never choose a Charger over 300 unless the Hellcat wasn't offered in the 300 a few years from now. I see nothing in the SS worth wanting. The wheels are not attractive. The car looks like a Malibu on steroids. The lack of a fold-down rear is the final straw. I got a 50" Vizio in my 300. The SS isn't selling well because of everything I just said. I'm no GM guy, but I like the looks of the SS over the Charger. The larger back seat is a real plus. However, price is a real show stopper - literally. The SS is averaging sales of only 269 SSs a month; Charger is averaging 7856/month - almost 30X more. Exchange rates or whatever, I don't see the SS going past 2016. Exterior - it's menacing. It's terrifying. The 392 Charger is long and blocky like a locomotive. When I see them on the road - I can't help but stare. The 2015 Charger looks like a spaceship with those lights and you can't tell a Hellcat from a regular SRT right away - which helps keep attention. It's absolutely no wonder to me why the Charger destroys the SS in sales. The manual alone is enough to go for it over the Charger. And I actually like the restrained styling of the SS, though it could look a little more exciting, and no car should have chrome. I just wish you could get this without all the electronic nannies. I doubt the average buyer of this car would actually get them if they were an option. Anyway, good review!